An excessive rain occurred causing flooding throughout the area, including the Sycamore Creek Wastewater Treatment Plant. Allied already had personnel at two other locations – another wastewater treatment plant and a factory – when they received a call from Sycamore Creek. The plant flooded so quickly there was nothing the staff could do. They needed outside help to remove water from the plant and get it back up and functioning quickly. Allied was called and responded immediately with personnel to set up pumps and begin the process of draining water from the plant. They worked with operations and maintenance staff to keep the online functions operating while they addressed the flooding. By midnight, about 12 hours after they were called, Allied had the Sycamore Creek Treatment plant operational. In order to complete the job of repairing the flood damage to the plant, Allied worked for six months with an average of six persons, ranging from 2 to 10 people, on site during this time. 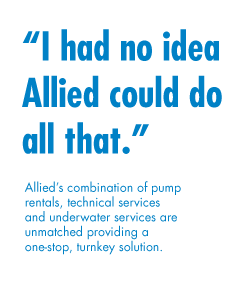 Allied brought out pumps and set them up quickly. Extra pumps were used to bypass a nearby pump station. They repaired and /or replaced valves. Provided public relations support by working with the persons complaining of excessive noise due to the 24 hour pumping taking place. Allied took measures to fix the issue and interacted positively with the public. While Allied ensured the online functions were operational in those first 12 hours, when they finished the job they had made enhancements to each system. 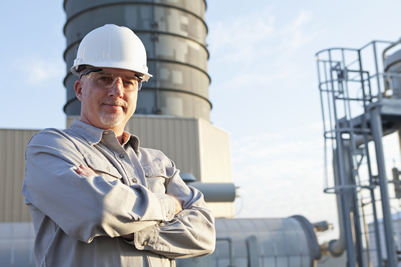 Allied is well rounded with experience and has the technical expertise to get the job done right.